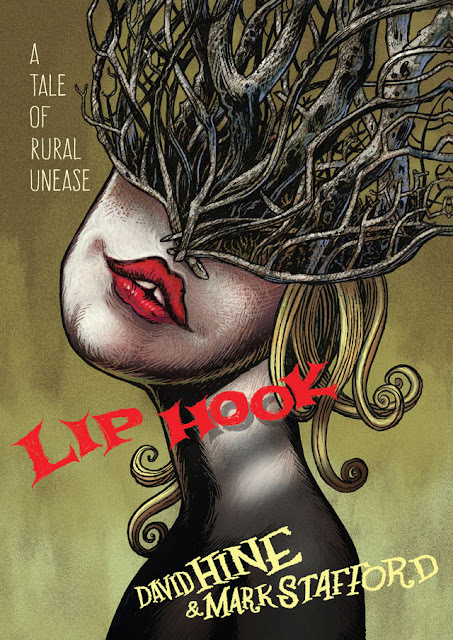 SelfMadeHero is delighted to announce the publication of LIP HOOK, an eerie original horror tale from British creators David Hine and Mark Stafford, the team behind the hugely popular The Man Who Laughs. the end of the world. Beyond it, there is only mist-shrouded marshland and swarms of insects. Few travelers choose the road to Lip Hook, but one day, two fugitives emerge from the fog: a dangerously beautiful woman and a man with a gunshot wound and a suitcase full of treasure. The villagers find their world disrupted by the two outsiders, who cause a return to ancient ways and resurrect a secret history perhaps best forgotten. David Hine and Mark Stafford have created a dark tale of rural unease that explores the nature of belief, the responsibilities of power and the tipping point where reason, logic and humanity begin to melt into the murk. Soaked in earthy colours, the book inhabits a tradition of British horror that includes the stories of M.R. James and Algernon Blackwood and films such as The Wicker Man and The Blood On Satan’s Claw. Lip Hook is published in full colour hardback and will be released by SelfMadeHero in the U.K. 18th October 2018 and in the US in November 2018.